While the world waits for the full remake of Final Fantasy VII, which is expected sometime this century, Square Enix has been giving gamers new opportunities to play the 1997 PlayStation title on a multitude of new platforms, adding Nintendo Switch and Xbox One to the list in 2019. Returning to the first 3D Final Fantasy makes for an interesting time; while certain areas of the game hold up, others have crumbled away. Its cast remains strong and its best moments still stand out, but in many other areas the game really shows its age. It’s tough to recall a time when those character models would have been looked upon favourably. Final Fantasy VII begins with its “Bombing Run” intro, as the mercenary Cloud assists Barret and the group Avalanche in blowing up a reactor in the corporation-run city of Midgar. Cloud is a former member of SOLDIER, the elite force run by Shinra to support the corporate interests that see it running virtually the entire world. Avalanche bills itself as an organisation dedicated to saving the planet from Shinra, but outside of causing admittedly a large amount of damage to Midgar, its fight appears doomed, and Cloud and company abandon it shortly after to pursue a more personal story chasing down the former elite SOLDIER Sephiroth. I personally would suggest finding a finished road. Final Fantasy VII doesn’t seem like it knows what direction it wants its plot to take. At times it wants to stand up to the evils of greedy corporations, but will then very quickly change tack into simply saving the world from a destructive madman. The terrorist nature of Avalanche is disappointingly forgotten about for most of the game as Sephiroth takes over and Shinra is highlighted as so obviously corrupt that any ambiguity is lost. The one time their terrorist past is recalled at the end, it seems to serve as a way for the party to immediately resolve its one piece of lingering conflict and show unity before the final battle. There’s very little time spent in establishing the world outside of the main cast and the upper echelons of Shinra, which also serves to dilute any messages and wider themes the game might be looking to explore. Despite its issues, the narrative still has plenty of positives. The ratio of memorable characters in the diverse cast is high and everyone gets at least a brief chance to shine, including the minor villains. All of the characters are strong and get either some growth or reveals into their personal stories that tie them to other important characters. There are plenty of great moments, including some particularly emotional and heartfelt ones, notwithstanding the one that has by now likely been spoiled millions of times. Thankfully, the game’s localisation has also been reworked from the mess that afflicted the original PlayStation release. 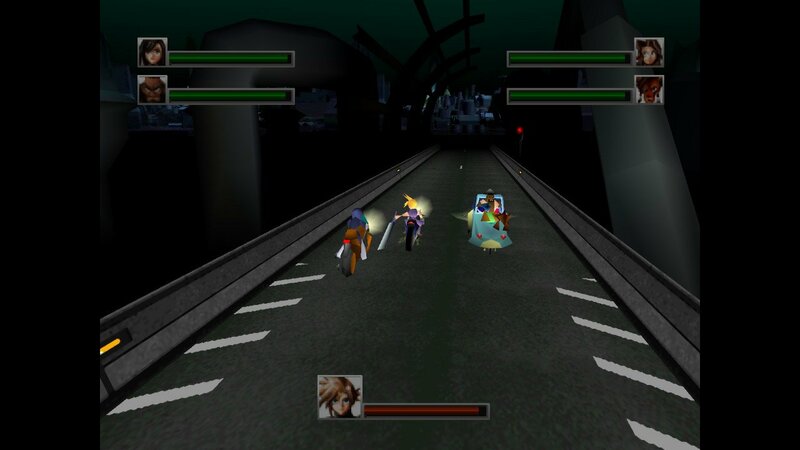 Final Fantasy VII utilises the series’ familiar ATB turn system, where each of the three party members has an action bar that quickly fills to denote when they can next act in combat. Outside of regular attack and item options, what powers the party has at its disposal are determined by equipping gems called Materia. This provides some neat flexibility and decisions for the player to make as to what Materia and thus combat options to put in the limited slots available. However, this comes at the cost of stopping the individual party members from feeling unique. The only signifcant differentiator between them becomes their limit breaks, offering little reason to swap out party members outside of perhaps gaining a couple of extra pieces of dialogue in certain events. The Materia menu also features one of the game’s most egregious cases of poor UI, as it hides what should be considered key Materia management options unless players somehow manage to stumble upon them. The difference between combat and regular character models is striking. The one main annoyance the battle system suffers from is long animations during combat, especially during summons. VII‘s battle system doesn’t have many of the bells and whistles of later titles, but it’s enjoyable throughout and, despite the animations, it never feels like combat drags on too long. The challenge feels fair, if perhaps geared a bit to the easy side with the exception of certain hard-hitting bosses. If players battle through encounters as they come, there never is a need to stop and grind. 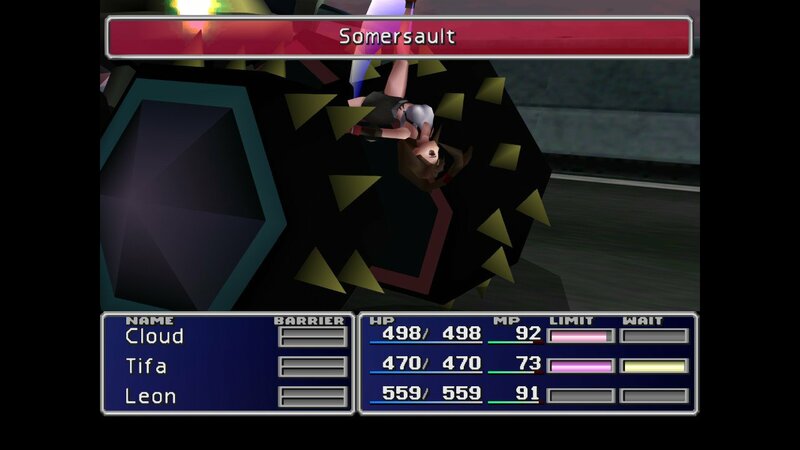 Final Fantasy VII has a minor obsession with mini-games. The attempt to break up or add some deeper interaction with the world and certain events is appreciated, but too many of these mini-games are simply annoying in either the gameplay behind them or a failure to provide proper instruction or feedback. Included in the Nintendo Switch version played are high-speed, no encounter, and full health and limit break gauge modes, which can readily be turned on or off with single button presses at any point. These new features are welcome inclusions and don’t take anything away from the game, simply serving to alleviate some potential pacing annoyances such as the aforementioned combat animations. The graphics are by far Final Fantasy VII‘s weakest point. The combat character models at least look decent, but the blocky ones used for exploration and events are downright terrible even by standards of twenty-odd years ago. Final Fantasy VII is further hindered by its environments. There is some good variety to them and some nice designs to many of the locations, but far too often it is unclear where exactly players are able or expected to go. The world map generally works well, but there are times where it can be tough to see the path to take, and a certain snowy location that features a different map is simply not fun to traverse. Final Fantasy VII really likes mini-games. One thing Final Fantasy has remained a leader in throughout its history is music, and Final Fantasy VII is no exception. Nobuo Uemtasu’s score is full of great tracks and the final boss theme is one of the standouts, not just for the game but the series overall. There are memorable tracks throughout with both variation and emotion. The Switch version includes a bug present in other recent versions of the game, where overworld and environmental music will restart following combat rather than picking up where it left off. It’s not a deal-breaker by any means, and many players may not even realise that it is occurring. Playing through Final Fantasy VII, it’s easy to see why it was the game in the series selected to be remade. There are some fundamental issues in its overall story and it certainly hasn’t stood the test of time as well as many other titles have, but it still provides a strong base with its engaging cast and it’s easy to see how its steampunk designs would look much better with today’s technology. Final Fantasy VII is worth checking out and offers plenty of entertaining moments, but it’s going to be appreciated by those looking at it with rose-tinted nostalgia far more than anyone picking it up for the first time. This review entirely missed the point. The story isn’t about Barret and his group of eco-terrorists or Sephiroth or even Cloud. It’s meant to be an allegory on the “life” of the planet and the effects of its inhabitants upon it. It knows exactly where it’s going and it’s a thread carried faithfully from the very first scenes to the ending cinematic. The game is hardly without its flaws — barely even qualifying as a game for much of its play time — but to mistake the carefully crafted story arcs showing contrasting aspects of human existence for “disappointing” misdirection of the plot is a gross injustice and just proves the writer woefully underqualified to review this game. 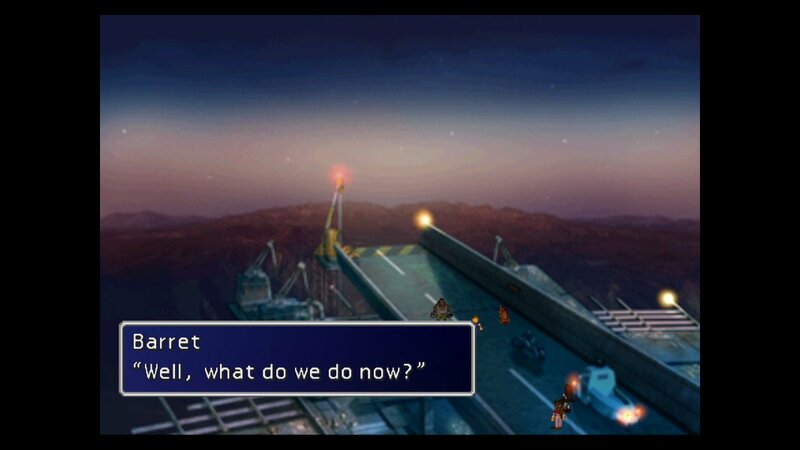 The writers of FF7 may have know where they wanted to go, but I surely never could figure it all out. I’ve played it many times, and always thought the story was a mess. Kinda of silly review…And wonder how the reviewer would feel about Final Fantasy 6 or 4 if the graphics in 7 annoy him? Yeah, the character models are blocky and cartoony…But the rest of the game is an absolute stunner with it’s art direction…And can remember reviews of it at the time actually praising the graphics so it’s simply not true the graphics felt dated 20+ years ago…And no the reason 7 is the one getting remade has nothing to do with it needing it the most. it’s simply because it’s the most popular…Minigames was a big deal when i played this title the 1st time everything just felt fun and there was always new things to do around the corner…And how on earth does the reviewer see 7 as steampunk? Oh, those are fine (the ones prior to the mobile/Steam version anyway). They’re designed to make the most of the restrictions that sprite graphics have and work with them and the player’s imagination. VII doesn’t have that; it’s cutscenes just look goofy now.